We are pleased to announce that the all-new Microsoft 365 security center and Microsoft 365 compliance center, are now generally available. Read this article to get an overview of what's new, what to expect, and required licenses and permissions. 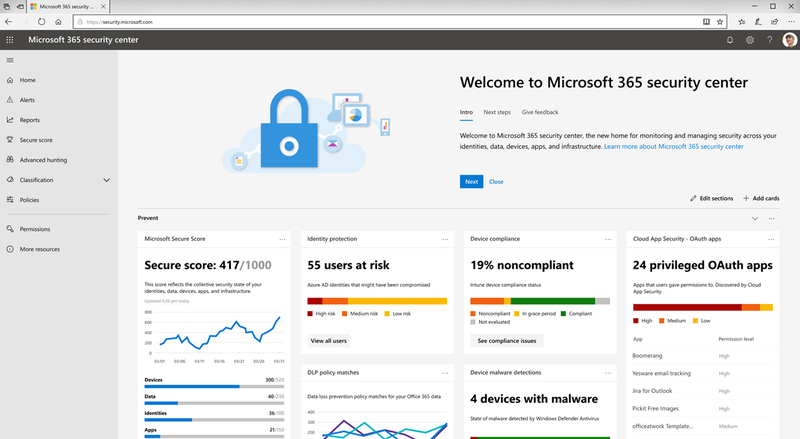 Your new Microsoft 365 security center includes a dashboard to help you manage and monitor security across your identities, data, devices, apps, and infrastructure. You will also have easy access to your all-new Microsoft Secure Score, new device threat reports, new identity threat reports, and your Cloud App Security reports. When you use the Microsoft 365 security center for the first time, you'll see information across the top of the screen to help you get started. You'll also see how to navigate easily to the security features you're most interested in exploring. To learn more, see Overview of the Microsoft 365 security center. You will be able to access the Microsoft 365 security center at https://security.microsoft.com. You must be assigned a valid Azure Active Directory role to access the Microsoft 365 security center. To learn more, see the Required licenses and permissions section (in this article). Your new Microsoft 365 compliance center provides you with visibility into Microsoft Compliance Manager, which reflects your overall compliance posture and gives you recommended actions to help you configure settings to meet complex compliance obligations. You’ll have easy access to sensitivity and retention labels and policies, data loss prevention (DLP), data governance, eDiscovery, data subject requests (DSRs), case management, and Cloud App Security. Additionally, you can gain actionable insights and leverage intelligent automation to reduce your compliance risks and safeguard your digital estate. When you use the Microsoft 365 compliance center for the first time, you'll see information across the top of the screen to help you get started. You'll see how to navigate easily to the compliance features you're most interested in exploring. To learn more, see Welcome to your all-new Microsoft 365 compliance center. 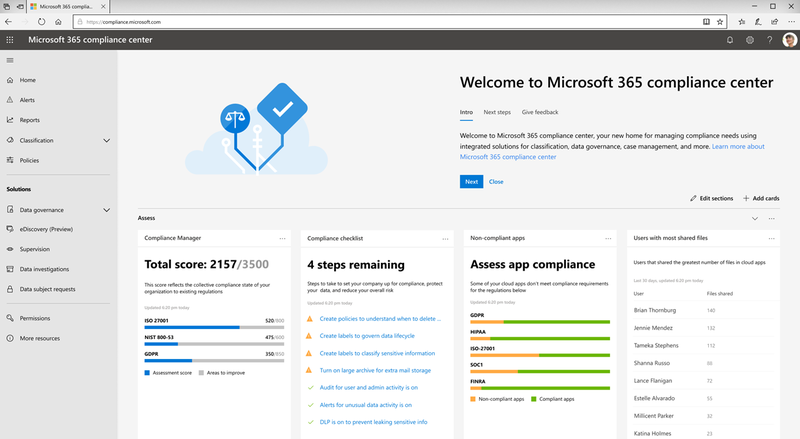 You will be to access the Microsoft 365 compliance center at https://compliance.microsoft.com. You must be assigned a valid Azure Active Directory role to access the Microsoft 365 compliance center. To learn more, see the Required licenses and permissions section (in this article). The new Microsoft 365 security center and the new Microsoft 365 compliance center are now generally available to Microsoft 365 customers, as of the end of March 2019. If you have another subscription, such as a standalone plan that includes the Office 365 Security & Compliance Center, you'll have access to the new Microsoft 365 security center and Microsoft 365 compliance center soon. To learn more, see the Microsoft 365 roadmap. With improved navigation, integrated solutions, and a streamlined experience, you'll be able to see and access the information you're most interested in and take advantage of the powerful security and compliance solutions in Microsoft 365. And, while more functionality and solutions are being added over the coming months, the Office 365 Security & Compliance Center (https://protection.microsoft.com) is still available. Go to the Microsoft 365 admin center (https://admin.microsoft.com), and navigate from there (in the navigation pane, click Show all, and then choose Security or Compliance). In addition, you can still configure and manage settings in the existing Office 365 Security & Compliance Center (https://protection.office.com). Your configurations will be maintained in both the existing Office 365 Security & Compliance Center and in the new Microsoft 365 security center and Microsoft 365 compliance center. To get the new Microsoft 365 security center and Microsoft 365 compliance center, your organization must have a subscription to Microsoft 365 E3 or E5, or a Volume Licensing equivalent (which consists of Office 365 Enterprise E3 or E5, Enterprise Mobility + Security E3 or E5, and Windows 10 Enterprise E3/E5). To learn more about these plans, see Discover the Microsoft 365 Enterprise solution that’s right for you. Users must be assigned the Global Administrator, Compliance Administrator, Compliance Data Administrator, Security Administrator, Security Operator, or Security Reader role in Azure Active Directory to access the new Microsoft 365 security center or Microsoft 365 compliance center. U kunt ook rechtstreeks op GitHub feedback achterlaten.